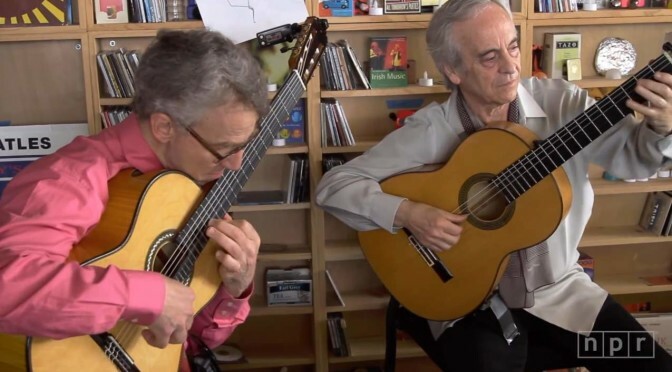 Two masters of the guitar – Eliot Fisk, a great classical guitarist, and Paco Peña, one of the greatest flamenco guitarists ever. In a tiny concert presented by NPR Music, they’re playing two classical and two flamenco pieces. The repertoire here ranges from Baroque compositions by Bach and Domenico Scarlatti to present-day flamenco. And what happens when these two master players get together is a mix of meticulous and improvised, with Fisk leaning toward the former and Peña toward the latter. Eliot Fisk looks like the happiest man on the planet. Watch that face as he plays guitar. Between performing music by J.S. Bach and partnering with the world’s best flamenco guitarist, Paco Peña, Fisk can barely control his joy. I find his exuberance and their performance undeniably brilliant, inspiring and so completely universal. 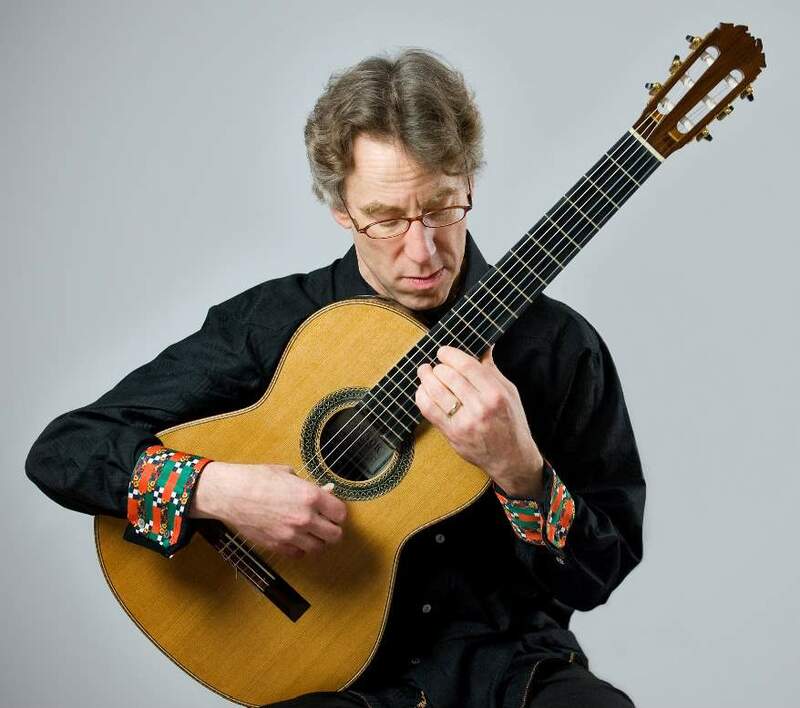 Eliot Fisk (born August 10, 1954, in Philadelphia, Pennsylvania) is an American classical guitarist and pedagogue. He was a student – in fact, the last student – of the great Spanish guitarist Andrés Segovia. Segovia has been regarded as one of the greatest guitarists of all time and is the only modern guitarist to achieve recognition with the general public. Many professional classical guitarists today are students of Segovia or students of his students. He is a professor at the Universität Mozarteum Salzburg in Austria, where he teaches in five different languages, and in Boston at the New England Conservatory. His students have come from many countries, and many have gone on to become important performers and teachers in their own right. Paco Peña (born 1 June 1942) is a Spanish flamenco composer and guitarist. He is regarded as one of the world’s foremost traditional Flamenco players. Peña also created the Centro Flamenco Paco Peña in Córdoba and was responsible for the founding of the now-celebrated annual Córdoba Guitar Festival, which has seen appearances by other Flamenco greats such as Manolo Sanlúcar and Paco de Lucía. His most famous compositions include his Misa Flamenca, a Flamenco Mass, and Requiem for the Earth, both of which have received great critical acclaim. He has also had a number of notable collaborations, significantly with the classical guitarist John Williams, Argentine folk music guitarist and composer Eduardo Falú and the Chilean group Inti-Illimani.